Chihiro, you’ve got red on you. This easter egg is found in Episode 1. 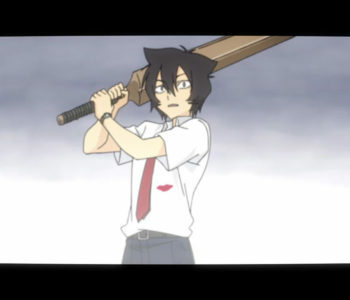 During the beginning of the episode when Chihiro is telling the viewer about how he’s always dreamed of having a zombie girlfriend, the scene cuts away to a zombie pig-tailed girl in a suit. 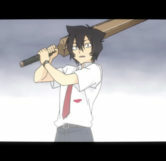 In the following scenes we see Chihiro dressed in a white dress shirt (with a red stain on it) and red tie holding a cricket bat. This outfit comes directly from the popular horror-comedy zombie film, Shaun of the Dead where the main character, Shaun wears a similar outfit with a red stain on his shirt caused by a pen (plus his name tag since it’s a work uniform). 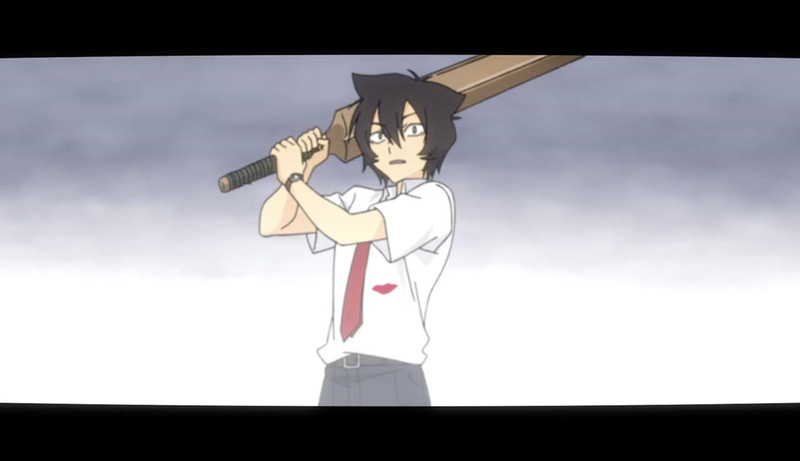 Shaun also uses a cricket bat as his signature weapon after finding out how surprisingly ineffective records are at killing zombies.